How Real Can a Fake Mars Mission Be? A 500-day mock mission to Mars may seem to some like an elaborate stunt, but the ongoing experiment — now at the Martian "landing" stage — has great potential to help prepare future astronauts for a real trip to the Red Planet, experts say. The Mars500 mission has reached its halfway point, with volunteer "astronauts" getting set to make a simulated landing on Mars tomorrow (Feb. 12). The project should help scientists and mission planners better understand — and perhaps mitigate — the psychological and physiological stresses a long space journey would impose on crewmembers, researchers said. "This is the start of getting fundamental behavioral ecology data from long-duration confinement," said David Dinges, a psychology professor at the University of Pennsylvania who is leading a study attached to the Mars500 project. "It's a rare opportunity." 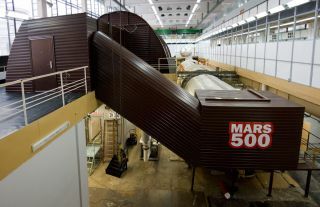 Mars500 is a $15 million experiment being run by the European Space Agency, Russia and China. It "launched" last June, when six male crewmembers were locked inside a windowless mock spaceship at the Institute of Biomedical Problems in Moscow. The project simulates a 500-day trip to Mars and back — hence the name. After about eight months of virtual interplanetary travel, the crewmembers — three Russians, two Europeans and a Chinese — are getting set to "land" on Mars tomorrow. Mars500 aims to study what astronauts on a long-duration spaceflight would experience. Understanding the stresses of such a journey is a major step toward preventing or mitigating them, researchers said. "The goal is, predict everything we can, prevent anything we can before the mission, detect anything that goes wrong in the mission, and intervene once we've detected it," Dinges told SPACE.com. Analog studies such as Mars500 are standard practice in spaceflight research. NASA does a great deal of such work, for example, including its annual Research and Technology Studies demonstrations in the Arizona desert (known as Desert RATS). For analog experiments to provide useful information, they should create conditions as close as possible to those experienced on the surface of the moon, say, or on the long journey to Mars. "You try to make it as high-fidelity as feasible, within your cost budget and within the architectural plans of what you envision," said Desert RATS mission manager Joe Kosmo, of NASA's Johnson Space Center. "The higher fidelity you can implement into it, the more success you would have." Mars500 is striving for high fidelity. By the end of the study, the astronauts will have been locked inside the spaceship simulator — which Dinges likened to a number of Winnebagos attached together — for about 18 months, though some will get a brief change of scenery when they start making forays onto the virtual Martian surface next week. The crewmembers are following a schedule similar to that experienced by astronauts aboard the International Space Station, ESA officials have said. They have two days off every week, and their work time during the "flight" is filled with maintenance jobs, experiments and daily exercise. "The value of this is, it has pretty good fidelity from the standpoint of human confinement and operational simulation," Dinges told SPACE.com. "The Russians are serious about that." And the crewmembers themselves — who include doctors, engineers and an astronaut trainer — are close approximations of "real" astronauts. "These are not just people who want to go in a biodome," Dinges said. "They're at least in the ballpark of the kinds of people who would go in spaceflight." The Mars500 crew only gets to shower once per week, and conversations with mission control all have a 20-minute lag to replicate the communications gulf between Earth and Mars. The astronauts will each earn about $97,000 for taking part in the experiment. By the end of the study, Mars500 will become the longest high-fidelity spaceflight simulation in history. It should extend researchers' knowledge of the impacts of space travel, since the longest any human has ever spent in space is 438 days. Russian cosmonaut Valery Polyakov set the record aboard the Mir space station in 1995. Dinges' study is one of about 100 different experiments being conducted during the Mars500 project. Dinges is looking at how long-term confinement and isolation affect crewmembers' alertness, stability of attention, sleep patterns and moods, among other things. He and his colleagues are also quantifying rates of tension and conflict among crewmembers, and between crew and mission control. That part of the study should provide particularly interesting information, Kosmo said. "It's going to put stress on people, I'm sure," Kosmo told SPACE.com. "How many folks do you know that you'd like to be stuck together with for 500 days?" Dinges said his team has been getting lots of good data so far during the experiment, though he declined to discuss any preliminary results. "I don't want to say anything that would in any way influence the behavior of the crew, because that's what we're studying," he said. The many different Mars500 experiments should provide a wealth of valuable information, Dinges said. The simulation — along with detailed studies of astronauts aboard the International Space Station — should help scientists and mission planners start to get a handle on the physical and psychological challenges long-duration spaceflight will pose to future astronauts. "This is really a global effort to understand what would happen in a very long mission," Dinges said. "I hope that this is just the first in a number of these opportunities to figure out what some of the key events will be for a long-duration mission."